The Curtis Model 1222 is an AC induction motor controller for ‘steer by wire’ electric power steering systems. In these systems, the steering motor functions as an actuator to change the angle of the vehicle’s steered wheel(s) and so change the direction of travel. The Model 1222 performs as the steering system controller, interpreting the steering command input and wheel position feedback, then driving the steering motor to move the steered wheel to the desired position. Designed for 300–1500W AC induction gearmotors. Intended applications are materials handling vehicles such as reach trucks, order pickers, stackers, ‘man up’ warehouse trucks and other similar industrial vehicles. A significant enhancement to the Curtis AC family, The ‘E’ models utilize a powerful dual-microprocessor logic architecture to provide improved performance and surpass the requirements of the latest international functional safety standards. The Curtis model 1232E provides advanced control of AC induction motors performing on-vehicle traction drive or hydraulic pump duties and offers the highest levels of functional safety. The Curtis Model 1232E is intended for use as the traction controller on class 3 materials handling ‘walkies’ and other small industrial trucks. It is equally suitable as the pump controller for auxiliary hydraulic functions on larger industrial vehicles. The Curtis ‘SE’ AC controllers utilize the latest technology to increase the peak current ratings for each size of controller. For a given rating, the SE models are smaller and lower cost than previous Curtis AC controllers, benefits that are highly advantageous for all types of applications. 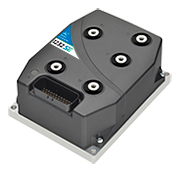 A range of controllers (inverters) for the speed and torque control of 3-phase AC motors rated from 1kW to 25 kW. 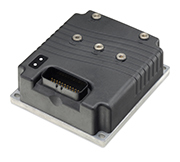 Intended for use as electric traction or hydraulic pump motor controllers for mobile, on-vehicle applications that use a 24-80Vdc nominal battery supply. Advanced motor drive software provides smooth control over full speed and torque in all modes, including full regenerative braking, zero speed, and torque control. 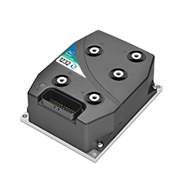 Specialized I/O and software features allow economical and effective control of electromagnetic brakes and hydraulic systems. 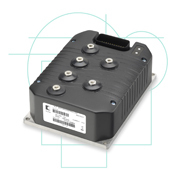 The Curtis 1234 Motor Speed Controller is designed for use in all types of electric vehicles including material handling, industrial, golf, and light-on-road. Generic software and VCL code is included for control of powered pallet jacks. Other applications can be easily supported with alternate VCL programming. 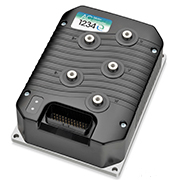 Curtis Models 1236E and 1238E provide advanced control of AC induction motors performing on-vehicle traction drive or hydraulic pump duties. They offer vehicle developers a highly cost-effective combination of power, performance and functionality. Designed primarily for use on medium to large material handling vehicles such as counterbalance or warehouse trucks. The Model 1236E is equally suitable for industrial utility vehicles. The larger Model 1238E is also intended for use on all heavy-duty applications such as Tow Tractors and Airport Ground Support Equipment (GSE). The Curtis Model 1239E with Isolated 12V logic provides energy efficient control of asynchronous AC induction motors performing on-vehicle traction drive duties. It offers vehicle developers a highly cost-effective combination of power, performance and functionality. Intended for electric and hybrid vehicles using 60–144V nominal system voltage for high power circuits, and a 12V chassis-grounded system for low-power control circuits. 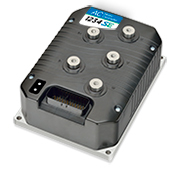 Software upgrade allows use with surface permanent magnet synchronous motors. Please contact Curtis technical support for more information. 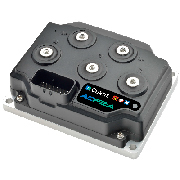 This Integrated AC Traction & Hydraulic System controller combines advanced AC traction motor control with solid state DC hydraulic pump and proportional valve control to provide a complete economical intgrated package. Primarily for Class III material handling vehicles requiring variable speed or soft start and stop control of the lift and lower functions. This new AC induction motor controller (inverter) uses dual high performance ARM Cortex microprocessors in an compact, package to deliver unmatched performance and a very flexible feature set. Model AC F2-A is fully optimized for use as a traction controller on 1.0 ton-2.0 ton class III pedestrian-operated powered pallet trucks. 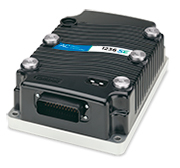 It provides vehicle designers with the ability to fully define and control the detailed dynamic performance of their vehicle’s drivetrain, and also provides comprehensive vehicle management and CAN master capabilities. Model AC F2-A is also suitable for traction or hydraulic pump control on other types of battery powered vehicles.